Mark Evans has this to say “This CO2 extraction from the dried kernels of the nutmeg plant is simply beautiful in comparison with the essential oil. It has a richer, more true-to-nature fragrance – very warm, suave, spicy-balsamic and strongly aromatic. The terpenes that are prominent in the odour profile of the EO and have a piny smell are almost non-existent in the CO2 making for a much more pleasant experience. This warming nutmeg CO2 can be used in spice accords, gourmands, incense bouquets, colognes, Oriental accords, chypres, fougeres and so on. 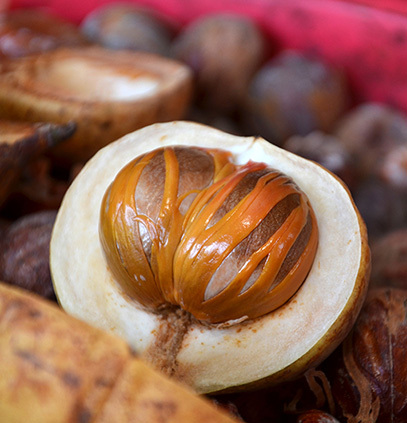 Nutmeg is a spice I hold very close to my heart since it reminds me dearly of my mother. When I was a child, she would prepare a hot nutmeg infusion to relieve my cramps. When I was older, she would cook delicious dishes using it to make chicken extra yummy. I’m pretty sure she would have loved to wear a perfume based on it. This offering both puzzles and mesmerizes me, as I had mostly known Nutmeg for its culinary purposes. When you use this marvelous CO2 on blends, something intriguing happens: it becomes woody when mixed with balsamic notes and balsamic when mixed with woody notes; it is sweet alongside bitter scents (say, Copaíba) and bitter when paired with sweet scents (Red Mandarin, for example); it is hot when blended with fresh ingredients (most herbs and grasses) and fresh while in the presence of hot ones ( Cinnamon and Peppers); all while keeping a very recognizable odor profile that can lay the foundation to great accords on its own. All in all, this mobile CO2 is even better than the real thing, since Nutmeg is prone to go bad and hard to measure in powder form. It’s somewhat tenacious, able to twist and enrich pretty much everything you throw it in and immensely valuable at your organ.